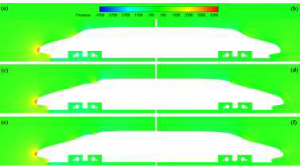 The study conducted by Lanzhou Jiaotong University and Central South University using RBF Morph having title “Study on the Aerodynamic Performance of the High-Speed Train Head with Symmetrical and Asymmetric Nose Shape” has been published on the SAGE journals. Aerodynamic drag reduction is one of the most important issues in the development of high-speed trains. This study focused on the aerodynamic optimization of the train by modifying the shape of the head car and tail car. Three shape parameters were studied in this paper: the angle of cab-window, nose-length, and nose-width of the train. The effects of shape parameters on the aerodynamic drag coefficients of the head car and tail car were discussed, respectively. It can be concluded that the flat surface of the window region, long and sharp nose are the distinguishing characters of a high-speed train with low resistance. Response surface models of the shape parameters and the aerodynamic drag of the head car and tail car were obtained, respectively. Based on these models, an aerodynamic optimization was performed to achieve the optimal shape. As a result, the total aerodynamic drag of the optimal train decreased by 2.05% compared with the original value.